There's a chance now for people who are thinking about suicide to experience what death really feels like. 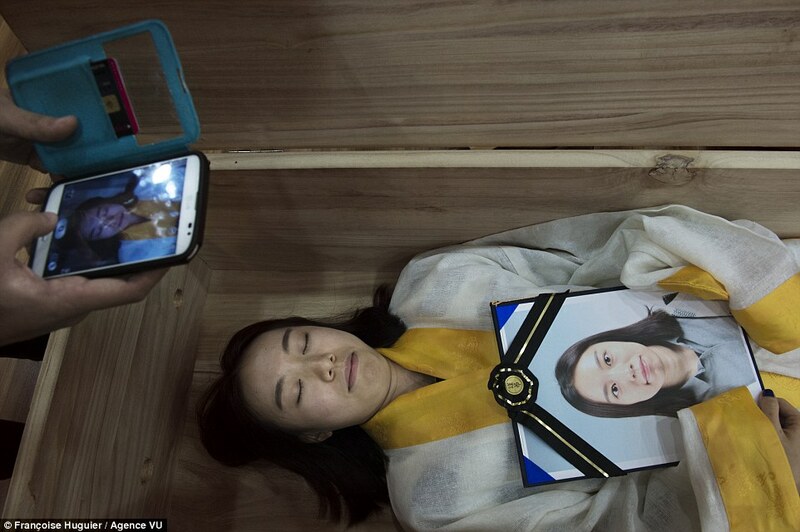 Suicide in South Korea is a serious and widespread problem, with the country having the second-highest suicide rate in the world according to the World Health Organization, as well as the highest suicide rate for an OECD member state. One reason for the cause of its high suicide rate compared to other countries in the developed world is due to a large amount of suicide among the elderly. The prevalence of suicide among elderly South Koreans is due to the amount of widespread poverty among senior citizens in South Korea, with nearly half of the country’s elderly population living below the poverty line. Combined with a poorly-funded social safety net for the elderly, this results in them killing themselves not to be a financial burden on their families, since the old social structure where children looked after their parents, has largely disappeared in the 21st century. As a result, people living in rural areas tend to have higher suicide rates. However, proactive government efforts to decrease the rate has shown effectiveness in 2014, when there were 27.3 suicides per 100,000 people, a 4.1% decline from the previous year (28.5 people) and the lowest in 6 years since 2008’s 26.0 people. Government and civil society organizations are relentless in their efforts to bring the high suicide rates to its barest minimum, if not completely wiped. 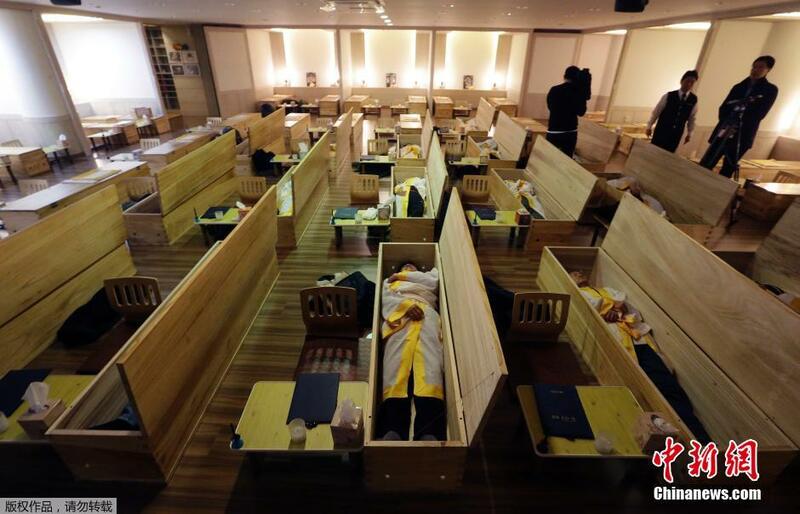 Now there are ‘death treatment centers’ in the Seoul where people can have near-death experience. It is a kind of rehabilitation home where the patients are required to observe, think and write diaries about every moment spent in or around their coffins. They’ll be all alone with the lights turned off. No noise, no distraction. They’re all by themselves – as expected in death. The death treatment exercise is aimed at letting people have a feel of what it looks like to be dead. It is hoped that the reality of actual death will help curtail the risks of more people ending their lives. They are made to sign fake wills and are locked inside coffins where they are given mock funeral services. And at the Seoul Hyowon Healing Centre in the capital, business is booming. Sitting between rows of coffins, with pens and paper littering small desks, the students listen as the head of the centre, former funeral company employee Jeong Yong-mun, explains that the problems we face in life are a part of life. They are told they must accept them and try to find joy in their hardships. Among the students are teenagers who can’t cope with exam pressure in school, parents who find themselves useless after their children have left home, and the elderly terrified of being a financial burden on their young families. In South Korea, there’s about 39 people committing suicide every single day. This is not a glorious record for a country that was ranked among the world’s largest economies (13th) just a few years back; currently one of the poorest – if not the poorest country in the world. Most of the patients who took part in the treatment confessed it’s too scary to die. No matter how difficult life is at the moment, it’s still better to live in suffering with the hope that tomorrow may bring something better. It is an act of cowardice to die by suicide. Would you suggest this as rehabilitation for people who are suicide risks? 6 Comments on Thinking About Suicide? Wait! This article is really educative. Thanks for writing. God really bless you for the selfless work you are doing for humanity. Keep it up and don’t let your focus get shaken for lack of recognition or something like that. Thanks a lot for this advice. It’s worth reading.